New Cold War or Recalibration of the Global System? On May 24, 2018, within the framework of the business program of the St. Petersburg International Economic Forum, the Valdai Discussion Club held a session, titled "Turning Back the Clock: Political Rivalry vs Economic Interaction". 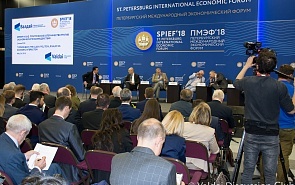 Participants in the special session discussed the prospects for maintaining an open international economic system in the context of politicization of economic relations. Although a new cold war between the East and the West is discussed more and more often, the estimates at the session were mostly optimistic: if the leading global players keep their common sense and do not translate their trade wars into military conflicts, the world economy will be more open and less volatile, and its rules will be established not just by one center of power. In recent years, negative factors for the development of the world economy have been growing. These are restrictions on free trade, capital flows, impeding the activities of the international trade and economic organizations, and, finally, politically motivated economic sanctions. According to Anton Siluanov, First Deputy Prime Minister and Minister of Finance of the Russian Federation, this is a dead end for the world economy. Third parties also suffer from the introduction of sanctions, including business in states which impose such restrictions, Siluanov stressed. The sanctions as an unambiguously negative factor both for the economies of the countries subjected to them, and for the world economic system as a whole, can nevertheless stimulate the long-overdue economic reforms. According to Siluanov, in case of Russia, there were sanctions that facilitated the transition to free exchange rate and a more stringent budget policy (this year the budget is balanced at an oil price of $50 per barrel, and next year - at $40). Moreover, he stressed, Russia is on the verge of structural reforms that should accelerate economic growth above the basic level of 1.5%. Sanctions and trade wars have a long-term impact on the international political system. American financier Jim Rogers, president of Rogers Holding Company, said that US President Donald Trump pushes Russia and China towards each other with his policies. This was confirmed by the Russian Minister of Finance, who pointed out that the two countries are developing new economic ties, and many Russian companies reorient their markets to the East at a time of confrontation with the West. All this is part of a broader process. Confidence in the world economic system, which is based on the actual monopoly of the West in the sphere of financial and economic rules, has been shattered. The politicization of economic relations by the countries that have established these rules is too obvious, which causes attempts by non-Western states to reconsider fundamental principles. Of course, a special role belongs to China, which is seen be many as the potential center of a new world economic system. As Rogers said, paraphrasing a well-known pre-election slogan, Donald Trump "returns greatness to China." However, it is not necessary to expect radical moves from China. According to Xu Sitao, chief economist and partner at Deloitte, the US and Chinese economies are highly interdependent, but the Chinese economy is much more open – its trade accounts for about 45% of GDP (about 25% in the US), and therefore it is more vulnerable. The US has more powerful leverage, but if used, it can damage itself in the long term, he said. According to him, the aggressive economic policy of the United States can ultimately lead to China's reorientation towards Europe. In this regard, a question arises of whether Europe is ready to reconsider its role in the world economic system. Is it ready to become a more independent player, especially in the face of aggravation of trade and economic tensions with the US, which is taking place right in front of our eyes? A heated discussion was caused by a question from Fyodor Lukyanov, research director of the Valdai Discussion Club, who asked whether the euro could become the second world reserve currency along with the US dollar, which accumulates the lion's share of international settlements. Jim Rogers believes that the euro has such a chance: having risen on the current chaos, the dollar will become too expensive and by 2030 it will no longer be the world reserve currency. Anton Siluanov said that Russia is ready to use the euro for financial settlements if the European partners state an unambiguous position. Meanwhile, Xavier Rolet, Chief Executive Officer of the London Stock Exchange Group Plc (2009-2017), expressed doubt that the euro will be able to become an alternative to the dollar in the foreseeable future, but he stressed that the world needs a global currency or a basket of currencies to make the basis of the world economy less volatile. The topic of reducing volatility was developed throughout the discussion. According to Andrey Bystritskiy, Chairman of the Board of the Foundation for Development and Support of the Valdai Discussion Club, Russia and China, while building new relations in the situation of sanctions and trade wars, jointly create a new space with special rules. The world is interconnected, he stressed, but we all lack global governance. The current political tensions are connected with the fear of a world where such global regulation is a necessity. His opinion was supported by Xavier Rolet. According to him, the processes in the world do not mean a new cold war, but a recalibration of the world system. Its result should be the creation of a global economic regulatory framework. "After the confrontation, we will come to a series of deals," he concluded. And for such deals to be made, a more intense dialogue between individual countries and integration associations is necessary. Strengthening new institutions, free of political pressure, such as the Asian Infrastructure Investment Bank, gives a reason to hope that the voice of non-Western players will sound louder and ultimately lead to the creation of framework organizations, capable to resolve effectively global development issues, the participants concluded.